It seems strange, but, besides coffee, the aspect of my life I miss the most while being pregnant is the workouts. The reason it seems strange is that, up until I got hooked on P90X, I could spin even the flimsiest excuse into weeks of skipped or half assed workouts. The saying “you don’t know what you’ve got ’till its gone” seems to apply, except, in this case, it is “you don’t know what you’ve got until you can’t do it for 9 months”. This realization has made me wonder what exactly I miss about those puke when done cardio workouts or “can’t lift my arms” strength days. I guess it might be the daily challenge of a new workout that will strain a new set of muscles, or as strange as it sounds, being soar. Those really aren’t good reasons, but I can’t really put my finger on what it is exactly. Maybe it is simply the endorphins that I can’t seem to do without these days. Whatever the case, I can’t wait for this baby to make her appearance for a lot of reasons, but one of them is that I can finally get back to working out. Anybody have any better reasons to miss working out? Instead of writing about fitness, a healthy meal, or something else fitness related, I decided to give an update on my pregnancy instead (truth be told, my workouts lately are generally limited to short strolls, and no one wants to hear about that). Being pregnant has been such an amazing experience so far (at least since the constant nausea has ended). At 24 weeks along, I’ve been able to feel her tiny kicks the last three weeks, my husband has too. I can’t quite describe the feeling but it feels like flutters going on in my stomach. When she is getting especially rambunctious I can feel light kicks without putting my hand over my stomach, and in the last week have even seen tiny kicks when looking at my bare tummy (she must be doing some crazy gymnastics in there for that to happen). We had a doctor appointment this past Wednesday and everything is moving right along! Heard the heartbeat, and she is measuring perfectly for 24 weeks! We’ll be getting nursery painted, which, up till now has been the most contentious baby related decision so far (somehow it was much tougher to name our two dogs). it feels like time is running out to finish all the little stuff that has to be done before I have even more trouble getting around. Other updates: my husband and I celebrated our three year wedding anniversary. Since we both were working, we “celebrated” by having dinner at the Hacienda, a Mexican food restaurant (no more dress up dinners at a fancy restaurant, just eating out is a nice diversion these days). We saw a 1 year old baby behaving badly and my husband and I agreed that wouldn’t be us next year (we will check back in and see how that is going, but I imagine all those well intentioned pledges go out the window along with a full night of sleep). 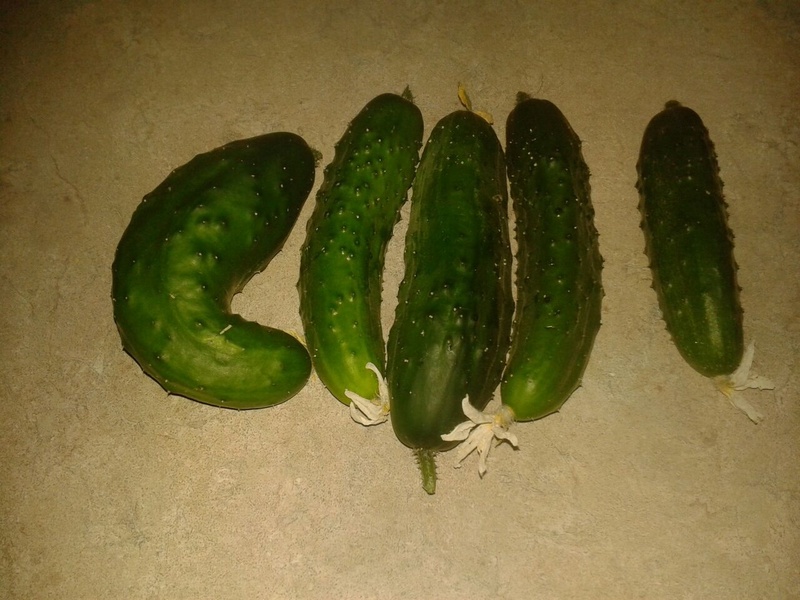 Saturday afternoon we harvested our first bunch of cucumbers (is there a proper adjective for a group of cucumbers?) from the garden (6 total) and since i am not a big fan of raw cucumbers, we decided to turn our bumper crop into dill pickles. Just add salt, spices and vinegar, wait two weeks, and any crazy pickle cravings will be taken care of, courtesy of the garden. 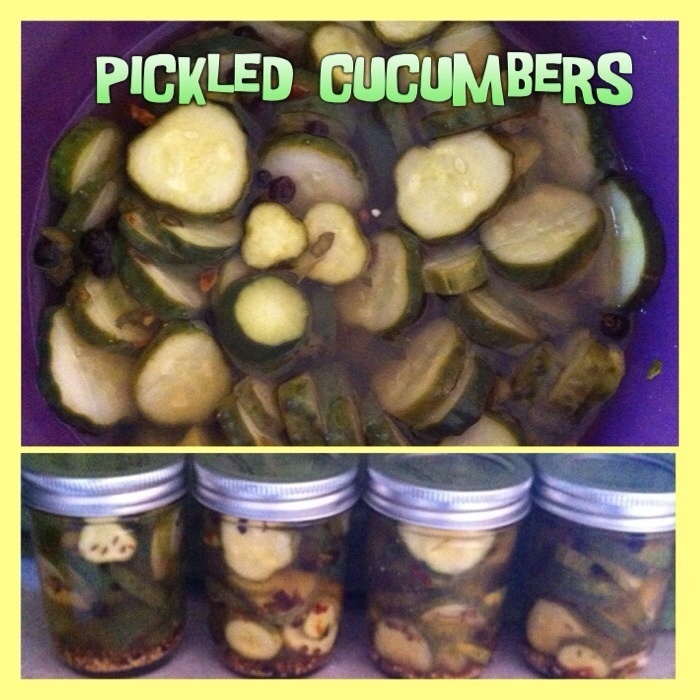 Any suggestions what we can do with our next batch of cucumbers?